Thomas runs to the Map Room to see what he can salvage. When he arrives, he finds a group of boys huddling around Minho who is cradling an injured Alby. Minho says that whoever set fire to the maps must have also beaten up Alby. After making sure that Alby is alright, Thomas tells Minho and Newt they need to come with him to the Slammer because he and Teresa may know how to solve the Maze. Burning the maps could represent the destruction of old, flawed ways of looking at the Maze, but Thomas knows he must have a new perspective to have any hope of finding an exit. This is the first indication that a compromise between traditional routine and change is necessary for survival. At the Slammer, Thomas pleads for Teresa’s release, convincing them that she had no control over triggering the end. Desperate and in need of whatever help they can get, Minho and Newt agree to let her out. Once she’s out, Thomas says that she remembers that the Maze is a code. Minho asks what kind of code and Thomas responds that he’ll be able to figure it out by studying the maps. Since they’re all burned, Thomas says that the Runners need to recreate as many maps as they can from memory so that he can figure out the code. Once again, Thomas’ hope remains firm despite not having the maps. As we saw with Minho in the Maze, without hope, people will give up and turn on each other. If that happens now, then the Gladers are doomed. Minho glances knowingly at Newt. Minho tells them that before the fire, they moved the maps from the Map Room because of Alby’s warning to protect the maps, and hid them in the weapons room. They all head over to check them out. In the weapons room, the maps gain new significance. They become the best “weapon” for solving the maze. Plaue, Ethan. "The Maze Runner Chapter 41." LitCharts. LitCharts LLC, 22 Jul 2015. Web. 18 Apr 2019. Plaue, Ethan. "The Maze Runner Chapter 41." LitCharts LLC, July 22, 2015. 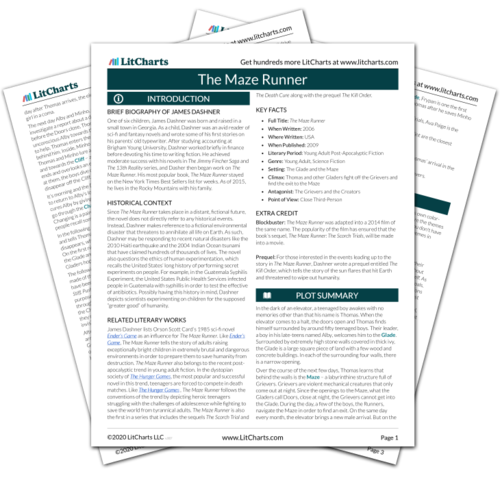 Retrieved April 18, 2019. https://www.litcharts.com/lit/the-maze-runner/chapter-41.